Hot Chocolate Station in the Classroom! Today was a non-kid day for me. I was at a district CCSS math training. It was our first official CCSS thing. It went well. I was impressed. I have to admit I was a little worried how our district was going to “introduce” CCSS. Now I know there is no need for worry. Yay. But, most importantly – we had an hour for lunch. An hour. This was fabulous. Normally we have 30 minutes. Well actually 20 minutes by the time we get our kids to the cafeteria. 15 minutes if you have to heat something to eat in the microwave. 10 if you need a potty break. Anyway, it was a good day. First of all, I have had a very long standing love affair with salted caramel ANYTHING. Secondly, that 2nd picture looks like the most incredible hot chocolate and must be about 5000 calories! I know for a fact because I will make it happen believe my kiddos smiley/frownie heart chain will be reaching the ground very soon. Finally! I’ve been telling them they really need to get that thing moving in a positive direction so we can hurry up and find out what our prize is. As if I don’t know. AND as if I don’t know it will come when the weather is cool. AND it will contain chocolate. I made some labels for the anticipated “prize”. I’m sure there is some reason YOU must throw a hot chocolate celebration of your own sometime soon. Click the pic to download a copy of the labels. Have a fabulous rest of the week teacher peeps! Oh my goodness Traci!! This is so cute! I think the Moffatt Girls may just LOVE a Hot Chocolate party! Your kids will go nuts over this!! What a fantastic idea! You're the BEST!! Love this! The labels are so cute an they are perfect! 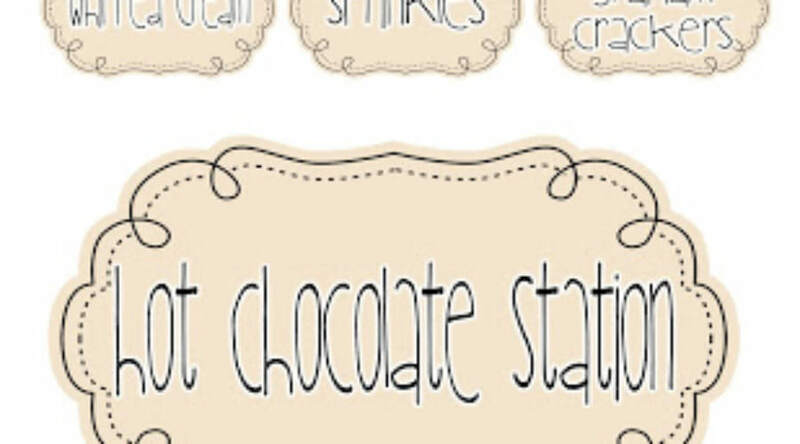 I have been wanting to do a hot chocolate bar. Thanks for sharing! A hot chocolate bar! I could totally get into that:) thanks for the yummy idea. You just gave me the best idea! We have PJ day with The Polar express, so I could set up a chocolate bar as their treat! You always have fantastic ideas! Thanks so much!! You are making me hungry/thirsty for some good stuff. Very cute! I am on the CCSS team for ELA and it has been very fun to learn about as well. We dive in next year and the year after will have the assessments to go with it. Too cute! Look REALLY good! I am so jealous!!! If you have time stop by my blog and enter my giveaway! Thanks so much!